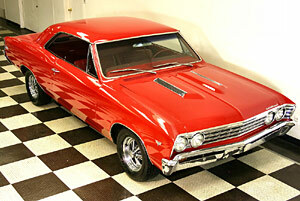 1967 CHEVELLE, THIS BEAUTIFULL RED ON RED #'S MATCHING CHEVELLE HAS NEWER PAINT AND CHROME. THE CAR WAS PAINTED WITH PPG CONCEPT BRIGHT RED. THE FLOORS AND QUARTERS WERE REPLACED IN THE RESTORATION PROCESS. 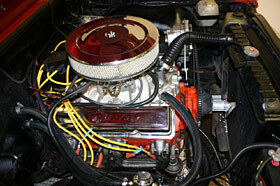 THE NUMBERS MATCHING 283 ENGINE AND NUMBERS MATCHING AUTOMATIC TRANSMISSION WERE REBUILT WITH ALMOST NO MILES ON THEM, NO LEAKS OR SMOKE. THEY BOTH PERFORM LIKE THEY SHOULD, THERES NO LEAKS, NO PUFFS OF OIL. THE DUAL EXHAUST OUT THE BACK AND HAS NICE LITTLE RUMBLE TO IT. 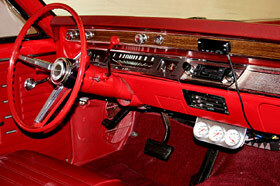 THE RED INTERIOR IS ALMOST LIKE NEW AND IT IS MINT, WITH NO RIPS OR TEARS!! THE CAR COMES WITH AN AWESOME AM/FM 6-CD CHANGER THAT ROCKS CHECK OUT THE MINI CONTROL ON THE DASH.